Happy Monday! Last week was amazing, in the way that I needed it to be for me. It was also a bit crazy. I always carry questions with me that I think about for weeks at a time. I excavate the answers through conversations, sound bites I over hear, things that come up or anything that pulls my attention and speaks to the question(s) that I hold. This week life surprised me each day and presented me with a wisdom or truth on different topics. Each wisdom answered questions I didn’t know I had or deepened my understanding on ideas that I have been contemplating. There have been three times in the past three years, where life hit me with new knowledge. Each hit felt mind blowing in some cases or like the wind was knocked out of me in others. For the first time, the impact of the answers, although heavy, didn’t land on me as hard as it has in the past. I simply noticed the answer, knowledge or truth and added it to the current dialogue that I am in with my reflection and meditation with the universe and myself. My work to be mindful and present is paying off in ways that I notice. Since February, I have been thinking a lot about the bigger picture. What does this all mean? Where is this all going? How do the small things we do today effect the larger community and the world. When you start to see things at a micro level it’s crazy how big of an impact that mirco thing can have in the world (The Butterfly Effect). (I learned about the Butterfly Effect in college and this is the first time I gained a deeper understanding of the theory.) 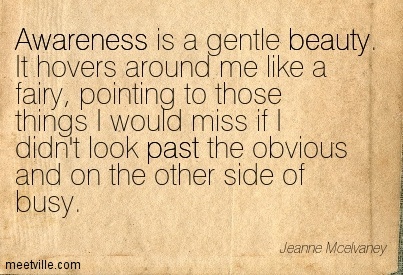 I also noticed my awareness expanding to see and hear more with people that are in proximity of me. Each time I think about awareness I think of the Matrix and the scene where Neo stops bullets from hitting him. That’s sort of where my awareness is going. It feels like life is slowing down, but really it’s just me slowing down to notice more and become more aware of life as it unfolds and passes daily. All new ideas I have to write about came up last week, rather then dive into those ideas I want to spend today and this week thinking about the awareness that led me here.